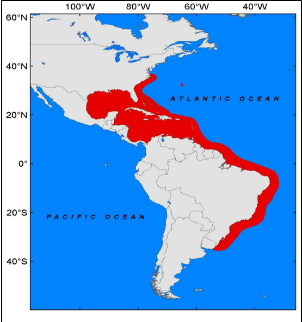 Many people ask ‘What’s the big deal with the lionfish invasion?’ If the lionfish is not a problem in the Pacific ocean then why is it a problem in the Atlantic? The answer is that the Pacific has had many thousands of years to reach stabilization with the rest of the marine life and the lionfish population has equalized. There are several factors, such as the lionfish breeding year round in the Caribbean versus seasonal breeding in the Pacific, as well as the lack of natural predators, the lionfish’s broad diet and habitat, and the lionfish possessing a method of hunting unlike other Atlantic species. This has created a ‘perfect storm’ of lionfish population explosion which has resulted in the lionfish crowding out the native species in sensitive breeding grounds. It’s possible, and likely, that eventually the environment will adapt and control the lionfish population growth but that hasn’t happened yet. We won’t ever eliminate the lionfish, they are too well established, are not easily caught on hook and line, and live in areas divers are not able to access. However, we can and must control the lionfish in the shallow areas where we frequently dive and where our native fish have their nurseries. Scientific studies have shown that divers spearfishing the lionfish on a regular basis are very effective at controlling the population in those places. The population of any invasive species follows a common predictable trajectory including a lag phase, followed by a period of population explosion, an invasion peak, and then finally equilibrium. We are currently still in the phase of exploding population and exponential growth. Until we can reach equilibrium we risk losing important habitat and bio-diversity of marine life to the invasive predator lionfish.